Thank you all for participating and looking at how many of you did, wish we could give one to each and every one of you! Alas, this bag belongs only to one and the person is radhika. Fret not, we will have another giveaway for you soon in a couple of weeks! We did not approve a few of the comments because they had outbound links, personal emails and addresses. They were considered in picking the winner though. It’s Giveaway time and with the help of MyLittleToteShop, we bring you the chance to win this limited edition Eiffel Tower Longchamp bag. Here are few titbits about MyLittleToteShop. They provide original brand packaging and paper wrapping. They only buy French luxury labels (Chanel, Goyard, etc). They can also help clients procure bags and limited editions that are available only in Paris, France and nowhere else in the world and even provide Free Shipping! So what do you have to do to win? Just let us know (via the comments section ) the price of this Eiffel Tower short handle tote as listed on MyLittleToteShop. Easy peasy, right? The price on the longchamps bag is $189. Hi there! i live in Houston-Texas! LOVE this bag! The price of this bag is listed as 209.00 USD. i would wuv it! please!?!?! It is $209! I want it! The Eiffel Tower short handle tote is $209 on MyLittleToteShop! What a find! The website is a great collection. The one you have here is just lust-worthy! The price is 189.00 USD. Hi, I would say the cost is 209.00 USD. I love it. Hope I get lucky too. The price of the tote is 209.00 USD !!! Pleaseeeeeeeeee P & P could you tell me if you are in India or America? I’ve asked many times but never get an answer! $209 USD – short handle with white Eiffel tower. It is the Eiffel Tower Medium Short Handle Tote Bag going for $209. Hope I win! Opps I got it wrong on the first go.. trying again its USD 209!!!! I just saw the other short handle bag…and that’s for 209.00 USD! Please don’t consider the above price!! Thanks!! The price of this Eiffel Tower short handle tote as listed on MyLittleToteShop is 209.00 USD. Hope you’re having a FUN day! The bag costs 209.00 USD. P&P………Thank you for yet another contest. I just love the site. The price of the tote i $209 USD. The price is 209$ !!!!! My fingers are *so* crossed right now – love you guys and love your blog! The tote sells for $209 on the website. 189 USD…. I have never won anything in my life.Maybe my luck will change today!! The price of the Eiffel Tower short handle tote as listed on MyLittleToteShop is $209 USD. The price listed on my little tote shop is a $189 USD. The price is 189 USD. Thanks! It’s listed at 209.00 USD. They have only 2 in stock? How many bags are they giving away? And who gets to decide who wins and how? Are the winners announced here on your blog? yes easy peasy missy! It is 209 USD. And btw since i am hooked to KWK i may borrow the hit line and say…”PnP..i will do anythingggggggggg for you guys..i mean anythinggggggg” Just gimme the bag!!!! P.S: Abhishek does it best! …… cute tote …. perfect for a sunday lunch . USD $209.00 for the short handle tote. Nice that you have a giveaway for ppl living in US. So here it is..
Eiffel Tower short handle tote is USD 209.00. The cost is 209.00 USD. $209 and that is a neat site! Thanks for the tip! i got the price !!! The price of this Tote Bag is 209 USD. $209! :) yay for giveaways! The price of the Eiffel Tower Short Handle Tote bag in the giveaway section is 209 USD. Priyanka and Payal, please-please-pretty please let me take this back. The correct answer is 209.00 USD! The price of this short handle tote is 209.00 USD. The price of this limited edition Eiffel Tower Longchamp bag is $189.00 USD. Hi, the lovely Cabas tote is priced at $189. Lucky US girlies!! Yay for you all. :( sad face for me!! Tote price: $189.00 USD … J’adore Paris, just went in September and if I was fluent in French, would have moved from NY immediately. Such a lovely tote! it’s $209, was looking at wrong image … sorry! wow..so simple..thought there should be a catch-209 $!! 209$!! hoping the comment will go thro this time..
and your blog is just awesome…Keep rocking!! The price of the bag is $209.00 USD. I think its a cute bag and hope to win. This Eiffel Tower Longchamp bag is worth $209 USD on Mylittletoteshop. On side note, I love your blog. Thanks. 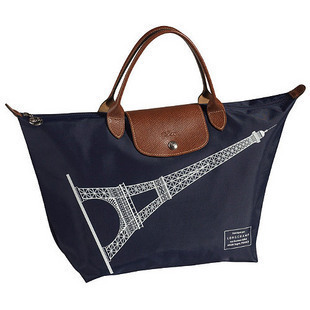 This Eiffel Tower Longchamp bag is $209 USD on MyLittleToteShop. On sidenote, I love this website and keep up with it everyday. Thanks. The price is 209.00 USD. Thanks P&P! Hi, I am based in Columbus, Ohio. The cost of the Eiffel Tower Tote is USD 209. The price is 189.00 USD! The bag costs 499 USD. The price of this “Eiffel Tower short handle tote” is $209. I know! Poor us aussies!! It is with $189….hope I win it!!! It’s priced at $189.00 at their website. The Eiffel Tower tote is 209.00 USD. I love this bag! USD209.00. I want this bag so badly. Entering for the first time!! I think this is where I am supposed to post the price. The price is $189.00. Is there an early bird winning? ;) Thanks! The price is $189 USD! Whoops, sorry – revising my answer. The SHORT handle tote bag = $209. Thanks! The price of the tote bag is $209. Have entered before, but i hope this one gets me the win! You should have a giveaway for your fans in Canada! Cant wait for the results!! $209 Pls make this pretty tote mine! The bag costs $209 (US). i really did not know where to put this :( since i follow the blog but i never really comment …. $209.00! Thanks for the Giveaway, whoever wins! $189.00 – I hope this is right place to submit the price for the bag! Have been eagerly waiting for this giveaway. The price of the lovely bag is 209.00 USD. 189 USD! I WANT THAT BAG. The price of this Eiffel Tower(medium) short handle tote bag in graphite- white Eiffel Tower is 209.00 USD. The price of the Eiffel Tower short handle tote is $209. The bag is $189 USD. It’s actually $209 if this is the short handle bag. Oops! sorry, can I change my answer to 209 USD? Hi, the price of the bag is $189. Thanks! Hey, Lucky for us girls based in the US. My guess would be $200. Hi! This bag is soooo cute! I want to enter! The price of the bag is $209 USD!!! Yay yay! I love your blog and read it religiously every morning when I wake up!!! $189, lovely website btw. Thanks. Its $189USD. Good luck to me! are we suppose to post the answer here? Isn’t this the comment section? Its the Longchamp tote for 209$?? i absolutely love this blog, and check for updates whenever i get free time during the day!! keep up the good work guys! Price of the bag is $209 ! It is USD 189 and it is BEAUTIFUL. I wish I win this tote! I love your blog…my morning doesn’t start without it! i’m in Europe as well, and I get so excited every time a giveaway comes up here, but I’m quickly reminded that it isn’t open to us :(. Hi PnP, The bag costs 209 USD! So excited for this. Its awesome. This tote is priced at 209.00$ USD. It costs 209.00 USD…now gimme the bag! Please? I will love you forever. It costs 209.00 USD. Please give me the bag. I’ll read your blog even more often than I do already. It costs 209.00 USD. Now gimme the bag! Please? I’ll love you forever! oh yea..and luckily..i am a us resident..yay! The price of the bag as listed on my little tote shop website is 189.00 USD. Is this all I need to do t be considered? The price for the bag is 209.00 dollars. where do we put the answer? Leave the answer as a comment. And don’t worry if it says awaiting moderation… We’ll approve all comments once the contest closes. OMG! Really cute bag!! I want it so badly to put my books in. Love your blog… I take a break from life each day to read it and totally relish those few minutes to live in the world of high fashion (vicariously)! I would love love love that bag! come on p&p ..when i saw this post i was thrilled..how cute would this look with my merci beau coup Tee! The bag’s for $209.00 on their website! I so want that bag!!! Please Please Please…pick my name. The cost is 209 USD. $209 for the hort handle bag….. The bag is for 209 USD. The cost is USD 209 :) Waiting for it.. Do you want the URL too? I this what we had to do ? Hi Pri&Pa (that’s how my friends and I refer to you gals).. I believe the cost of that tote is $209. Merci beaucoup for the fab opportunity!! Hi, I would like to participate in the contest. That’s a truly adorable bag. It costs 209 USD. Heyyy…. nice cute bag…. i want it…the cost is $209… I so wish i win it…. 189 USD. I’m not a US resident, but if i DO win, I’d like to send the bag to my dear cousin in Frisco, so please do consider my entry! Thanks so very much, your blog is addictive as hell. The short handle tote bag is $209 and the long handle bag is $219. I think the picture in your post is the short handle one. The bag is listed as $209.00! HOOhooo.. atlast one for us. The Eiffel Tower short handle tote as listed on MyLittleToteShop.com is 209.00 USD. The price of the Eiffel Tower -Short handle Tote bag is 209.00 USD . yipeeeeeeee for a gieaway in US…….. It is listed for $209.00 USD! The price of the bag is 209 USD. The Price is 209$ USD. And the answer is 209 USD. I live in Sunnyvale, USA and here’s my submission. The price of this Eiffel Tower tote is listed as 209.00 USD. The price of the Eiffel Tower tote is listed as 209.00 USD. But nothing for me sitting in Bangalore slogging my asses off in RnD to make biotherapeutics and cure people of cancer!!! Thanks for a giveaway for the US readers!! The price of the Eiffel Tower short handle tote as listed on MyLittleToteShop is $209. the bag is $209 and its really cute. hope to win it ! lol.. .btw thanks for the tip off on the website. Hello ladies… The cost of the Eiffel Tower short handle tote bag is US$209.00. I have a baby on the way and I am imagining this as an uber fashionable diaper bag. What do you think?!? A mom’s gotta have style right?